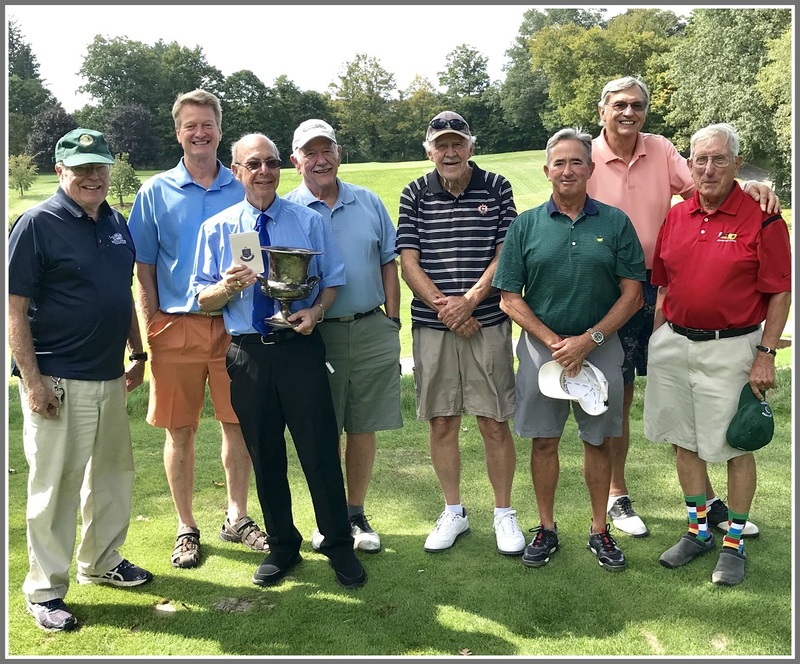 The annual Retired Staples Golf Tournament was held recently at Newtown Country Club. For decades, they could not dream of getting on the course on a lovely September afternoon. Now it’s no problem. This year’s champion is Gerry Kuroghlian. However, his scorecard is still being examined by the rules committee. Can you identify all these legendary educators? Answers below. This entry was posted in People, Sports, Staples HS and tagged Gerry Kuroghlian, Jim Wheeler, Staples High School. Bookmark the permalink. Back when we were their students they seemed so much older than we. Now? Not so much. Enjoy your well earned retirement gentlemen. BTW, how many of those grey hairs were my work? I think mr Blunicki was my photography teacher. I think Mr. Van Hagen, Mr. Bludnicki and Mr. MacFadden also taught at Coleytown Jr. High before moving up to Staples. I remember them all!!! What a blast from the wonderful past!! Hello gentlemen! I, too, remember them all. How wonderful to see them together! Hi Mr. Wheeler! Happy Retirement! Thanks to you and my other teachers at Staples I felt well launched on an art Education career. I have fond memories of my classes–especially art–at Staples. Thank you! Susan, it is nice to hear from you. I hope life Post Staples hastreated you well.